Dimenes is a program useful to design metallic structures for the most common cases. 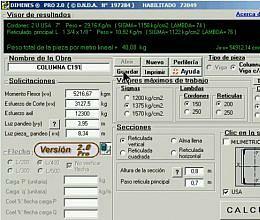 Basically it is a calculator for sections of beams, columns and bars, which compares different solutions and performs qualitative and quantitative computation of materials. The tables of profiles correspond to steel ST 37 DIN standards, USA or F 22 type CIRSOC standards, Normal and of folded foil. 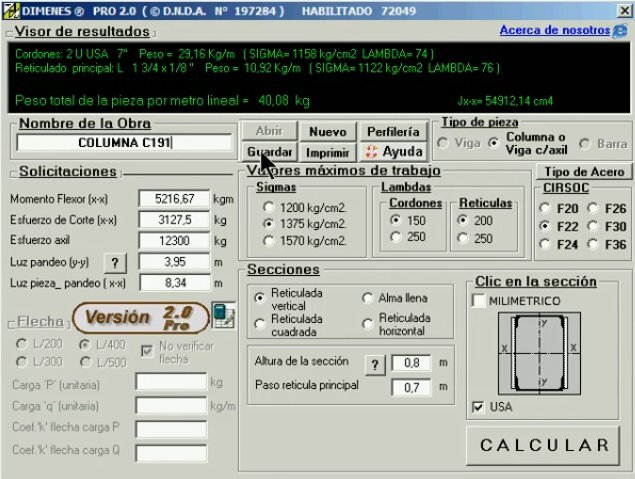 With these profiles (that can be replaced by the author to the user's order for other profiles used in his region) you can obtain pieces of up to approximately 220 Kg per lineal meter, data that give an idea of the utilization scope. The present demo version doesn't limit any function of the program. The only limitation is that you won't be able to calculate all the sections available in the complete version of Dimenes. * Dimenes download link provides demo version of the software. No one has rated Dimenes yet. Be the first to rate this product.